Alcohol has been extensively abused as an appetite stimulant and as a sedative-hypnotic drug. Alcohol intake, which is initiated as an innocent social habit, can gradually result in serious addiction. It may lead to several serious psycho-social problems and accidents. Drinkers can be classified on the basis of their consumption of alcohol and their ability to cope. A 'social drinker' may take two to three units of alcohol a week and does not become intoxicated. A 'heavy drinker' usually drinks up to six units a day without apparent immediate harm, whereas a 'problem drinker' has physical, psychological, social, family, legal or occupational problems attributable to drinking. A 'dependent drinker' is usually a consistent drinker with an increased tolerance to alcohol initially, which reduces later. 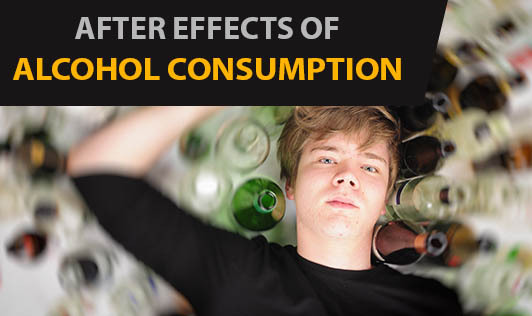 Let's take a look at some deleterious consequences of alcohol intake. Excessive alcohol use can affect every part of a person's life, causing serious medical problems, family conflict, legal difficulties and job loss. It starts slowly and one cannot make out when the alcohol intake starts increasing and when it becomes an addiction. One starts drinking to feel at ease, to increase confidence or to try and forget worries. An addict, regularly starts to neglect meals in favor of alcohol and prefers to drink alone. This leads to mood swings that start to cause problems at home and at work, sometimes even persistent shakes, hallucinations and night sweats. Finally, it can prove fatal. You have now read about what alcohol does to you. So you can decide if you should drink alcohol and if you do drink, how much of alcohol you should drink.